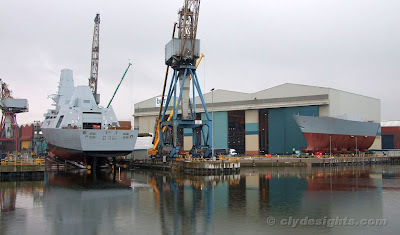 Also seen from WAVERLEY at the BVT Surface Fleet Govan shipyard, the fifth Type 45 destroyer DEFENDER was being given the final praparations for her launch in two day's time. Waiting in the yard are several of the modules for the next, and final, ship, DUNCAN, including her radar mast. One of the two grandstands in the yard was also undergoing final preparation. In this view seating for the VIP guests in the launch party was being lifted to the grandstand by forklift truck. The structures attached to DEFENDER's hull at either end, known as 'poppets', will give the ship stability as she slides down the ways and into the river. Below the poppets are the sliding ways - the white-painted timbers which will float free once the ship is in the water. Also visible on the right of this view is one of the steel hawsers which secures the dragchains to the ship's hull. These chains bring her to a swift halt in a pre-calculated position once she has been launched. Before the ship is towed to her berth, the chains must be released and pins - later removed by shipyard workers on board - are fitted to the brackets securing them to the hull. 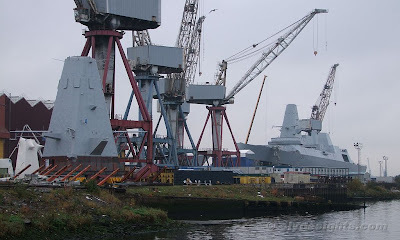 To the right of DEFENDER, the bow of the last ship of the class waits for DEFENDER to be launched before it is positioned on the slip. 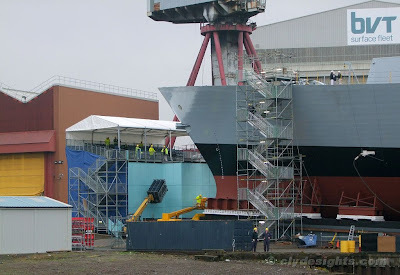 Inside the building shed, some of the other hull modules are taking shape and will join the bow section, which was built in the south of England and delivered by barge earlier this year, on the slipway.